Monster Mash Tour: Te Fiti Mash-up – Everything Your Mama Made & More! 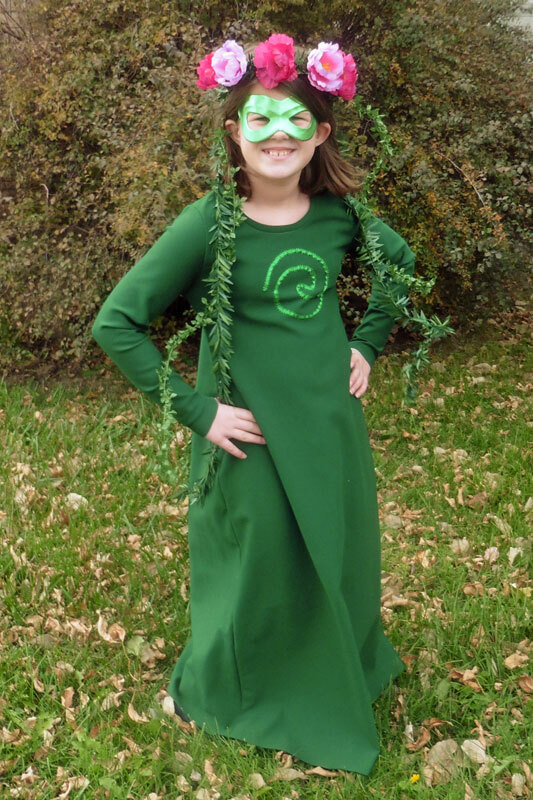 My kids have been discussing Halloween for months … and every year they ask me to sew their costumes! 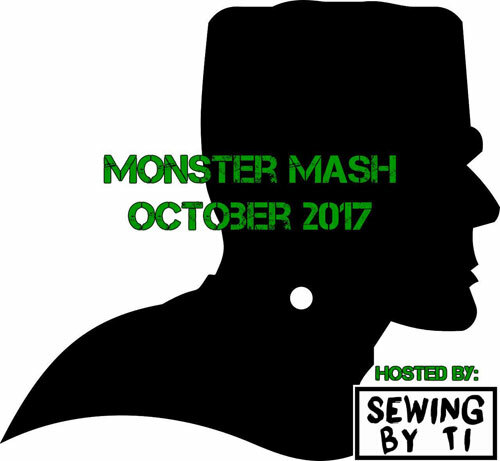 So when Ti announced that her October blog tour would be titled “Monster Mash” and would be geared toward either costumes or mashing patterns to create a new look, I jumped on board! When my girls decided to go as Moana and Te Fiti, I knew that I could easily make a Te Fiti dress and that it would fit in the tour under both costumes and pattern mashing!! 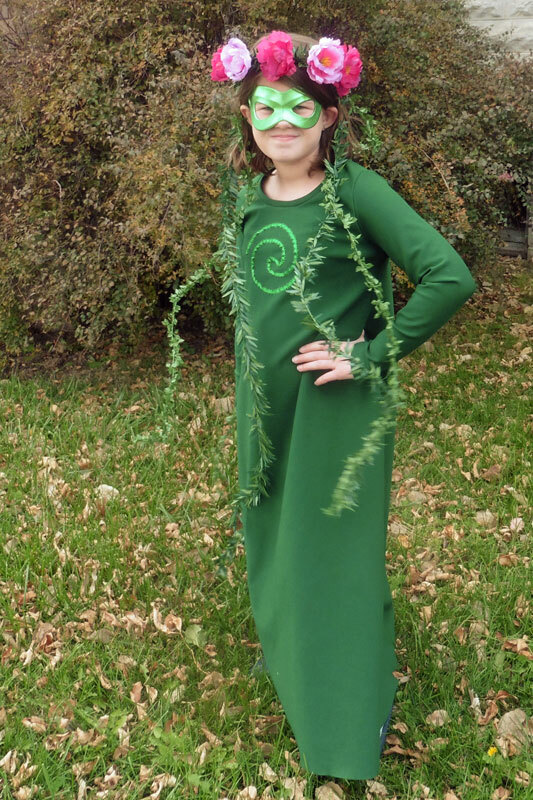 To create the base of her Te Fiti costume, I immediately decided to make my younger daughter a floor-length California Dress mashed to have the sleeves of the Four Seasons Cardigan. To do this, I referred back to my California Cardi Sleeve Mash tutorial that I’ve sewn many times for myself, though this was the first time I mashed the girl’s size patterns. I traced off my daughter’s size of the California scoop neck bodice, widened the shoulder by 1/2 inch, and mashed on the front armscye of the Four Seasons Cardigan rather than tracing the California’s armhole curve (p.s. there’s more detail on how to do this in my tutorial found here). I repeated the tracing process with the Four Seasons Cardigan’s back armscye to create the pattern for the back of her dress. Then I decided to raise the back neckline because of the cooler weather at the end of October. I just “eyeballed” it to draw the curve higher, making sure that there wasn’t a point up or dip down at the center fold line. Since I changed the back neckline, I needed to then also change the length of the neckband. To figure the new neckband length, I measured the total length of the new neckline (both back and front), multiplied by 0.85, and then added on seam allowance to each end. The only green knit fabric that my JoAnn Fabrics had that wasn’t a thin performance knit was this darker green refined ponte. I knew that its thickness wouldn’t drape well and look nice with the California’s elastic waistline, so I opted to leave off the waistline. After sewing the dress and trying it on my girl, it looked a little baggy (partly because of the fabric weight and partly because the California Dress is meant to be blouson when sewn in the correct size). Ti fix it, I pinched out a bit of fabric on each side of her chest and brought the side seam closer to her body, tapering it back out to the original seam at her natural waist height. 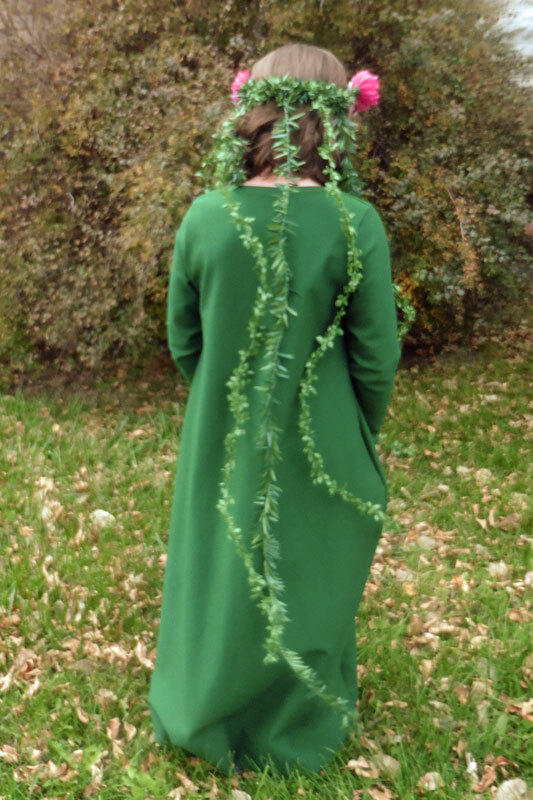 The final component of her Te Fiti costume was a flower crown with hanging vine tendrils. I was so glad that this was “enough” for to make my daughter happy because the image of Te Fiti in the Moana movie has many MANY more vines hanging from her body! My girlie really wanted to paint her face and hands green since Te Fiti in the movie is completely green, but I really really didn’t want to deal with the mess of face paint. 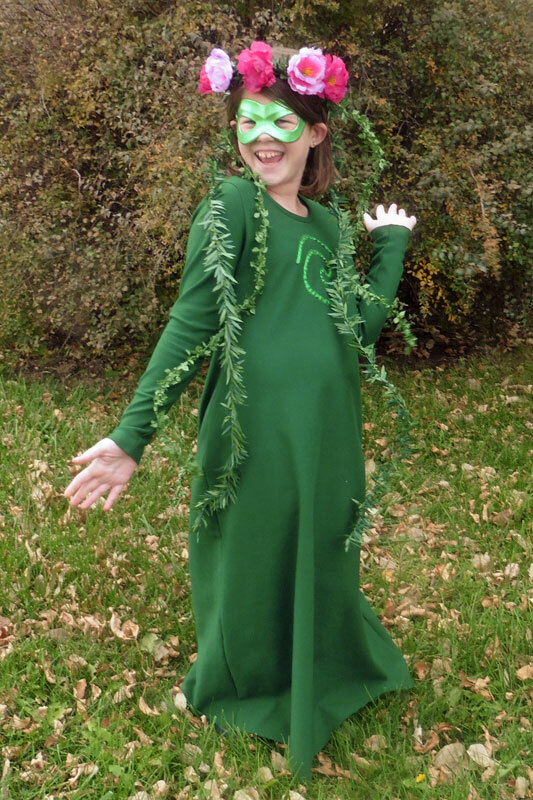 We compromised and bought a shiny green mask and a can of wash-out green hairspray (we didn’t put it on for these pictures, but plan to spray her hair for trick-or-treating). P.S. I’m super glad I got to be part of Ti’s Monster Mash blog tour! Ready to join us? 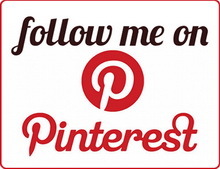 Don’t miss checking out all the tour stops listed below!